There is just something about the squish of a newborn baby, right?! The way the little rolls and wrinkles just scream “I’m new here!”.. So delicious. 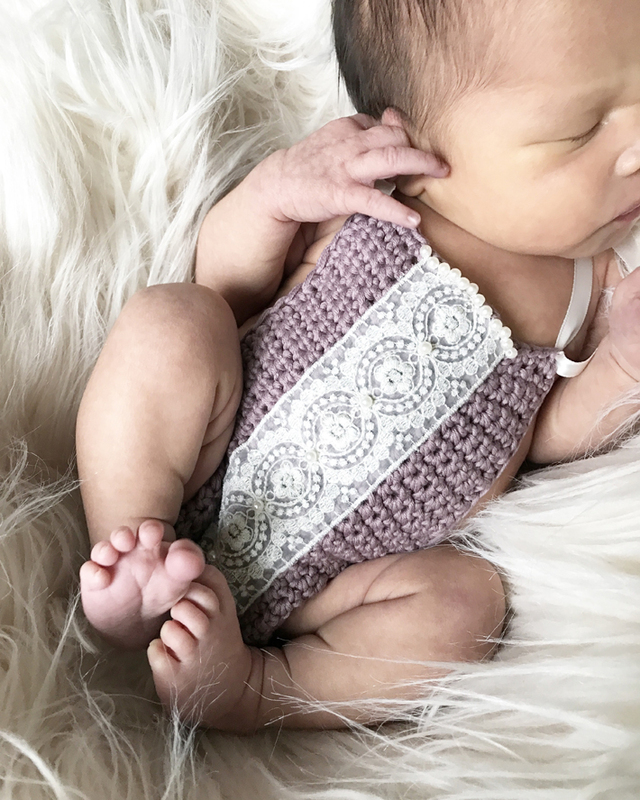 Recently when my best friend found out that she was pregnant with a little girl, I knew I had to to make the most delicate, most feminine little outfit for this coming babe. After having my friend come to my house, pick through all of the yarn in my stash to find the perfect choice, I knew exactly what to make when she showed me. Her and I browsed Pinterest a bit to get some detail design ideas and we both unanimously agreed that lace and pearls HAD to be included. 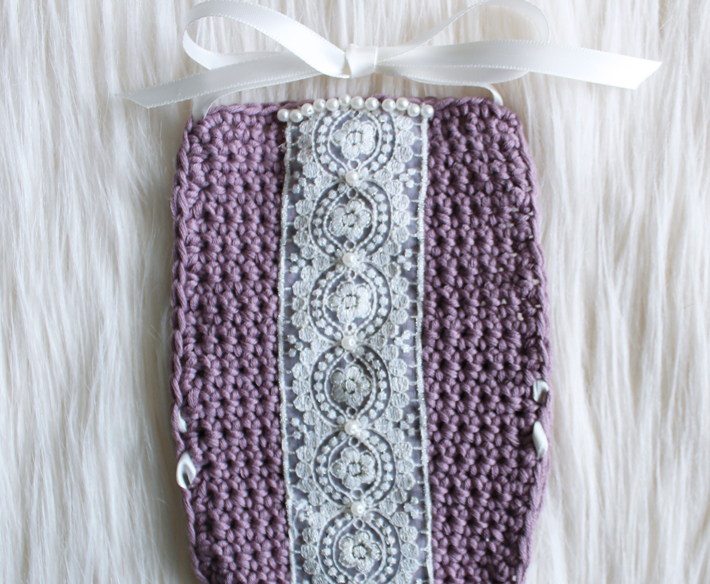 I know I don’t normally make baby items, but I was just flooded with inspiration about this impending arrival of my best friend’s baby and was totally willing to step out of my comfort zone for this project. Besides, I knew I was going to end up getting the squishiest picture of a babe in something lace-y and pearl-y. Swoon! Once I started on this piece, I just couldn’t stop. 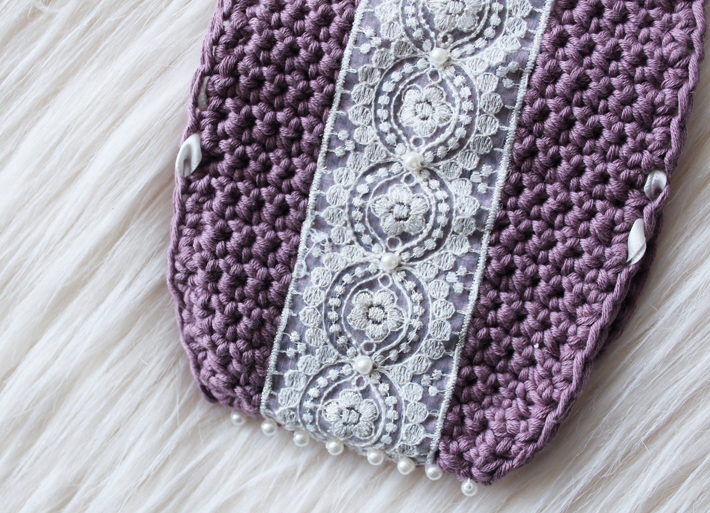 I HAD to get the crocheted portion done so I could do the fun stuff with the detailing!! I have never taken the extra time like I did with this piece to hand stitch small details and, knowing that I want to challenge myself and see what I’m capable of, I wanted to try it. I’ve seen some seriously amazing stitch-work from others in the fashion and craft industries and I can now truly see the talent (and patience) needed to accomplish such fine perfection. With one detailed project under my belt, I now have so many new ideas flooding my mind to further this skill. I am SO excited to fine tune my detailing abilities to try and create things I never knew I was possible of creating. Wanna know a funny story? So, my friend isn’t actually due until this summer but I was DYING to see an actual baby in this thing. I posted to my personal Facebook page asking if I knew anyone that had a newborn I could photograph.. I have never felt so creepy in my life. Ha! But with the help of a friend (thanks, Kelsey! ), I was able to scurry over to a new mama’s home to snap a few photos. You guys, I got to hold and dress this teeny 6.5lb babe. So tiny, so squishy and oh-so-perfect. 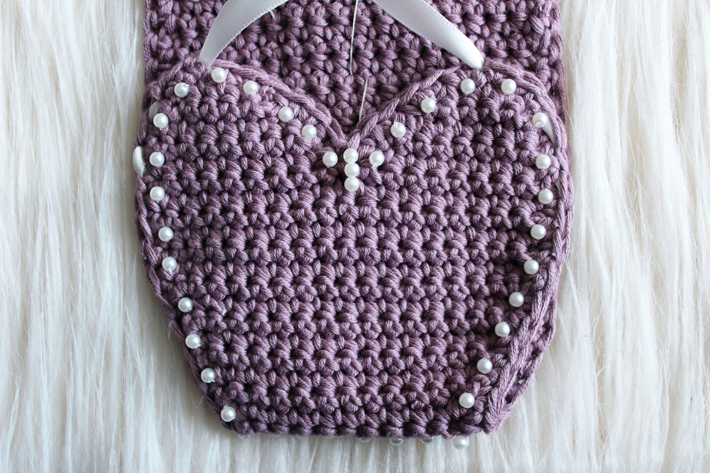 I am so excited to make some more baby items as we prepare for this tiny little princess that will be joining us soon. Have you ever been flooded with inspiration for something that you don’t typically enjoy making? What was it? Sometimes stepping out of our comfort zones can be so motivating! !